Dental bridges are used to close the gap between teeth that is created by one or more missing teeth. 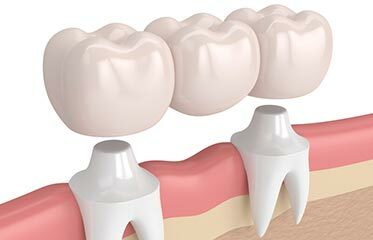 A dental bridge is made up of dental crowns that are anchored to the remaining neighboring teeth. The crowns on the bridge can be made of a variety of materials including gold, alloys, porcelain or a combination of these. Dental bridges can either be supported by natural teeth or even dental implants. Call Dr. Muradian, our Simi Valley dentist today for a consultation! Dental bridges can usually be placed by our Simi Valley dentist in just a couple of visits. During your first visit, expect to have the neighboring teeth prepared for the bridge placement. Impressions will also be taken to ensure proper fit and design of the dental bridge. Our dentist, Dr. Muradian, will create a temporary bridge for you to wear in order to protect the exposed teeth and gums while your permanent dental bridge is manufactured. During the subsequent visit to our Simi Valley dental office, the temporary bridge is removed and the new, permanent bridge is put in place. Our dentist will then ensure that everything is placed properly and that the fit is perfect before cementing it into place. Dental bridges are a great solution for any patient missing teeth. We encourage you to call our office if you think you need a dental bridge or would like to know more information.